At the moment, there is no approved rabies vaccine for wolf dogs. An amendment to the Virus Toxin Serum Act was proposed in September of 1999 and is still is pending approval. 13 The proposed change would either approve the vaccination of wolf dogs for rabies or deny it. Wolf dog breeders and wolf dog owners organized to push this proposed amendment on the national level. They are very organized and are passionate about their cause. Animal professionals took the opposite stand just as passionately. The outcome remains to be seen. 1. Wild. No rabies vaccine is licensed for use in wild animals. Because of the risk for rabies among wild animals (especially raccoons, skunks, coyotes, foxes, and bats), the American Veterinary Medical Association (AVMA), the National Association of State Public Health Veterinarians, Inc. (NASPHV), and the Council of State and Territorial Epidemiologists (CSTE) recommend the enactment of state laws prohibiting the importation, distribution, relocation, or keeping of wild animals and wild animals that are crossbred to domestic dogs and cats as pets. Part I: D) WILDLIFE AND HYBRID ANIMAL VACCINATION: The efficacy of parenteral rabies vaccination of wildlife and hybrids (the offspring of wild animals crossbred to domestic dogs and cats) has not been established, and no such vaccine is licensed for these animals. Zoos or research institutions may establish vaccination programs which attempt to protect valuable animals, but these should not replace appropriate public health activities that protect humans. The Journal of the American Veterinary Medical Association documented and reported a vaccination failure in a wolf dog hybrid in 1994. 16 Concerns over the vaccine issue revolve around the immune systems of wolf or wolf dog crosses being more sensitive than domesticated dogs and thus more vulnerable to infection. First innoculations are not always effective and NO rabies vaccine is currently approved for wolves or wolf dogs. Even so, many owners who inoculate their wolf dog hybrids prefer to use a killed virus vaccine to prevent infection through the injection of a modified live virus. Multiple inoculations are needed to build up the immunity when a killed virus is used. Due to the many liability and other regulatory concerns, those who own hybrids often won't claim that they are wolf dogs. They often claim that their animal is a husky, malamute or other mix of animal so they can get them inoculated. Many will not own up to the ownership of a wolf dog hybrid simply to avoid facing any complications. These differences in codes and laws arise because of the debate between different agencies; are hybrids domestic or wild animals? Each area may have differences on who handles the regulation and other issues related to these animals. A wolf dog owner is legally responsible to abide by these laws and know what they are. Many owners circumvent the legalities by listing their animals as a German shepherd mix, malamute mix, or husky mix, rather than acknowledge them as wolf dogs. Some cities and counties have proposed and passed breed specific ordinances banning the ownership of specific dog breeds such as pit bulls. These ordinances, if they are to be enforced, would require pedigree analysis, DNA testing, and other activities would have to identify the breed accurately. Mixed breed or unregistered animals would create challenges. These types of ordinances seem to also be a constitutional violation of the fourteenth amendment for equal protection under the law for all. A better answer is to have more stringent animal control laws and the enforcement of them. For instance, in my community located in the southern California mountains, there are laws regulating the care and control of animals. The owners of dogs that are loose in the community, or that are off leash, are breaking the law and in violation of the local ordinances. If each neighborhood and community would rally around policing or making the irresponsible owners accountable, like they do for crime watches, change might occur quickly. Wolf dogs and topics involving them usually are emotionally motivated. Those engaged in their breeding swear by them, while others have referred to them as monsters. Some people swear that they have a hybrid and that it is a "good" one, but in my behavioral consulting business I see troubled animals. These troubled animals usually do not stay in the home. There are many distress calls and emails from new owners of wolf dog hybrids. The experiences of these owners are not good. The problem is so wide scope that across the nation, on a daily basis, behaviorists, zoos and sanctuaries are inundated daily with calls from people wanting to place wolf dogs that are not working out. Many of the facilities that rescue wild animals (Wolf dogs are put into this category but do not fit it the domestic or wild category.) won't take them or can't because their facilities are already so overloaded. Sanctuaries have become dumping grounds. Discarding an animal at a shelter or sanctuary shows a lack of commitment and preplanning on the part of the owner and the breeder. Wolf dog hybrid owners are biting into more than just a mouthful when they get an animal. Although there are some good sanctuaries, 18 there are also those that are called "scam-tuaries." A good sanctuary has adequate space for the animals they house, provide educational services regarding the issues surrounding their charges, and provide screening and placement in qualified homes. They do not sell pups or the adult animals that they are dedicated to rescuing. "Scam-tuaries" are running a scam by breeding and selling animals. Many have substandard conditions that they house them in. They always have puppies to place or are willing to sell animals to those who are interested. 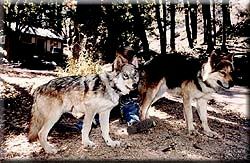 If you feel you really want a wolf dog hybrid you should first financially support a rescued wolf dog at one of the better sanctuaries or rescue facilities. I recommend that you support the rescue facilities through their "adoption" and donation programs. Then take the time to volunteer at one and get to know the issues. If you are still interested, take a course that teaches you up close and personal about what the animal is like. After all these efforts, perhaps you can qualify to adopt an abandoned animal from one of these facilities and give it a stable home. If you follow these steps, your efforts will help support the sanctuaries, fight the irresponsible trade in these animals and better prepare you for a life with a wolf dog if you choose to own one.